This is a continuing report on the new findings for the reactors at Fukushima Daiichi from the recent NDF Conference. We have broken down this information by reactor unit due to the size. This article focuses only on unit 3. Our commentary is in bold, the quotes from the report are in italics. Per our unit 3 timeline records these data points are relevant to the above graph. Note on the graph that Fire engine water made no contribution. Containment spray was conducted only at unit 3. TEPCO has not explained if this was a choice at unit 3 or if unit 3 was the only unit where this function was an available option at the time. The visual evidence to date showed that unit 3’s reactor vessel failure was not a gross abrupt failure but was a set of small failures in the reactor vessel bottom head that allowed molten fuel to drop down into containment at what was likely a slower rate. The role water in containment may have played in this may be a critical factor towards understanding the events at unit 3 including the large explosion. The combined total space of the available space minus existing water of the suppression chamber and the drywell space would make 35 cubic meters of water create a small contribution attempting to fill the containment structure. The drywell space would have part of its volume taken up by various small structures and piping. TEPCO’s estimations of fuel debris remaining in the reactor vessel considers there to be no fuel remaining in the reactor vessel. 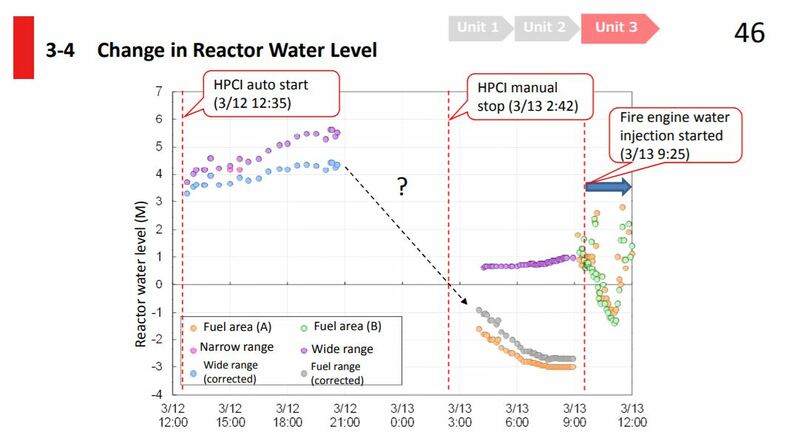 The more recent final report on the unit’s muon scan confirms this to be the case, that there is little or no fuel remaining in unit 3’s reactor vessel. This is the one location where it is assumed there might be fuel debris residues. The above comments by TEPCO indicate that there may be residues in the reactor vessel. The retained water may be a behavior caused by the small failure holes in the bottom head of the reactor vessel. 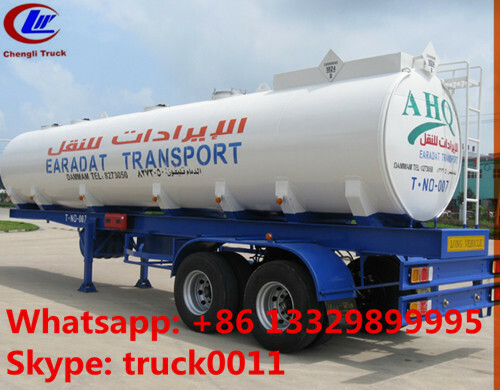 This could cause water to drain out of the failed vessel in a slow manner. The recent visuals obtained with the swimming robot used to inspect unit 3’s containment may have helped create these estimates. Images of some fuel debris that appears to have dropped then quickly solidified in the pedestal area were unlikely to have reached the concrete surfaces. The large volume of hydrogen assumed to have built up in unit 3 and migrated into unit 4 would have required a considerable capability to produce hydrogen. ・Meanwhile, DW spraying was performed for more than 1 h from 7:39 on March 13 in response to the accident. Diffusion of fuel debris could have been suppressed considering a water level on DW floor during pressure vessel breakage. ・If water is pooled on PCV floor, particulate debris can be formed. Particulate debris is more subject to breaking apart into fine materials. This makes it more likely to be leaked out of the reactor containment through various mechanisms. If there was sufficient water in containment to create particulate debris this could have also contributed to hydrogen generation and criticality risks. The final muon scan published after this NDF report confirmed there is little to no fuel left in the reactor vessel. ・Fire engine water injection started at 9:25 on March 13, damage to fuel is considered to have progressed during the period when injection was not allowed. The HPCI system was the only cooling water system remaining after the RCIC system died on March 12th. These problems with the HPCI may have been the critical turning point where unit 3 began to catastrophically fail. At around 9 o’clock and past 12 o’clock on March 13, 2011, the containment pressure has increased significantly. Like Unit 2, this could be caused by a large amount of hydrogen generated there and most of the fuel could have melted. There was a spike in containment pressure post 12:00 noon on 3.13. Core melt took place prior to 12:00 noon on that day. The earlier spike at 9 am may have been related to cooling injection loss and the attempt to use the containment spray system. Around the same time we noticed the opening of the steam relief valve (SRV) as documented in some of the post disaster accountings. This valve releases steam from the reactor vessel into the suppression chamber (SC) torus tube. This may have contributed to the increases in pressure around this same time. *** 9:08am March 13 battery assist SRV opening about the same time both RPV pressure readings went off the charts then back down. Batteries were scavenged from employee cars to do this. 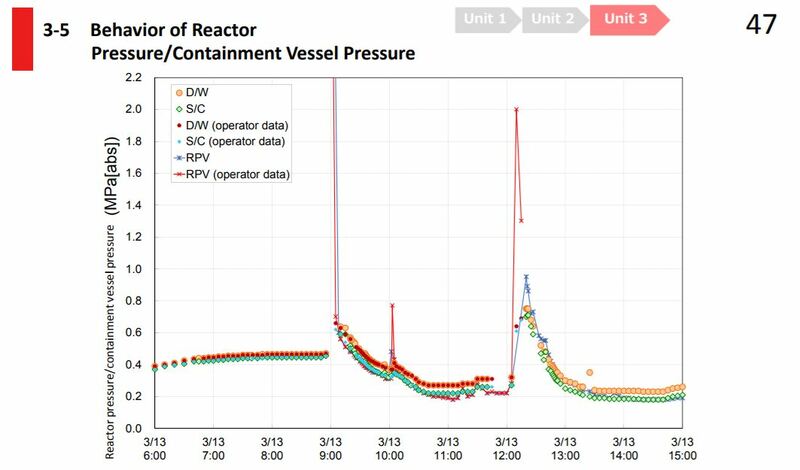 The SRV opening at 9:08 lines up with the off the charts RPV pressure and abrupt drop in pressure. The 12 noon increases in RPV pressure roughly matches the time where they may have run out of fresh water to inject by fire line then needed to switch to sea water. If they had no cooling injection during that period of time it may have played a role in the RPV pressure increase. At Unit 3, water level in the containment vessel is relatively high (about 6 m) compared to Units 1 and 2. May 15, 2014, after the investigation of MSIV room, leakage of water is observed from the periphery of the expansion joint of main steam pipe D. → Because the containment vessel maintains a high water level, it is not considered to have reached shell attack. Also cited in the report where they consider the relatively high water level in containment as proof that the “shell attack” did not happen. This refers to the behavior where molten corium can reach the edge of the containment floor and burn through the narrow portions that hold less concrete. So far evidence from the torus room would appear to back this up as no burns, heat or steam damage or water leaks were found. The entire torus room has not been inspected though, based on data made public to date. 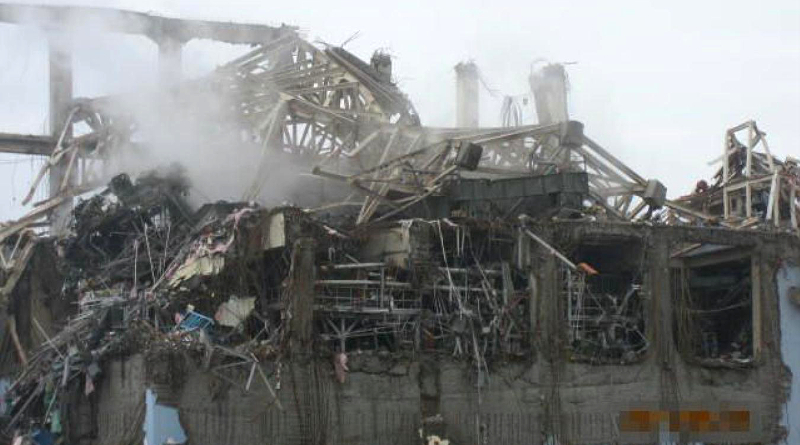 In Unit 4, hydrogen explosion occurred in the reactor building around 6:14 on March 15. 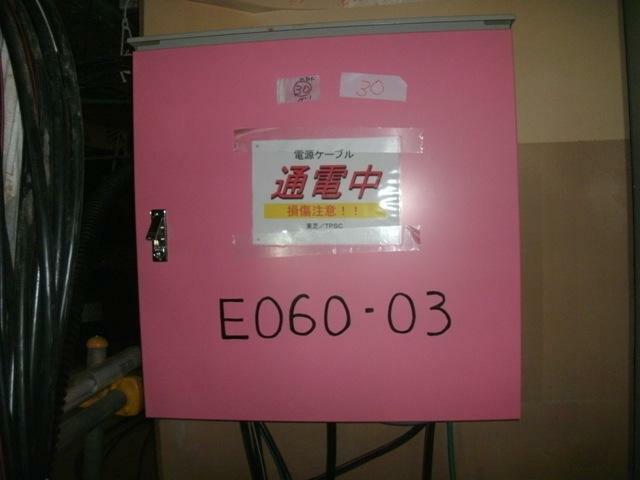 The vent gas of Unit 3 is considered to be getting into the Unit 4 reactor building. Units 3 and 4 exploded due to hydrogen generated in Unit 3. 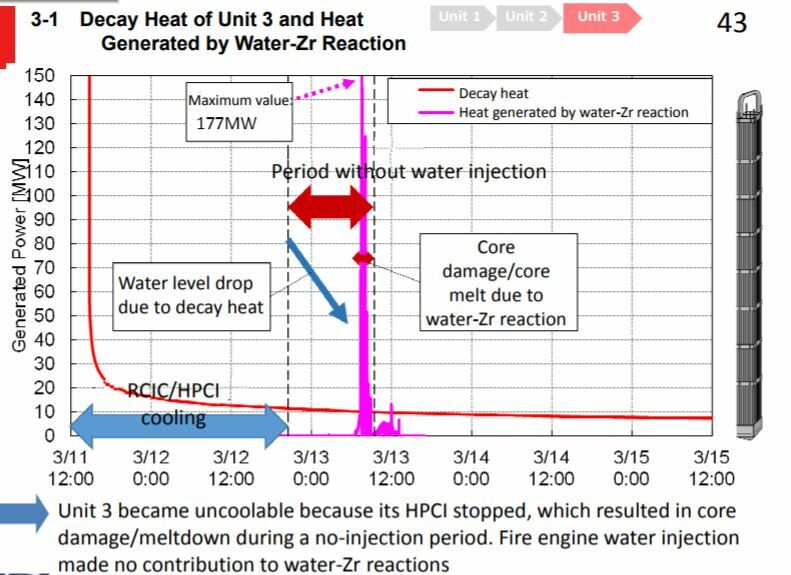 In addition to the hydrogen generated by water-Zr reaction, the hydrogen generated by MCCI could possibly have contributed to explosion. TEPCO has shown that hydrogen from unit 3 likely did leak back into unit 4 via the venting and standby gas treatment system filters. They found higher contamination on the down stream side of the unit 4 filter bank than was found on the up stream side. This seems to indicate contaminated air including high concentrations of hydrogen were pushed into unit 4. It is possible that the over heating in unit 4’s pool also contributed some hydrogen to the situation but was likely not the only source. Later investigations of unit 4’s pool showed heavy oxidation on some fuel assemblies that match the hottest portion of the spent fuel pool during the disaster as identified by US Air Force drones. Unit 3’s NDF report did not hold any major new surprises but it does seem to help confirm some earlier assumptions and speculation. Understanding the events that took place inside unit 3 will still take time to fully understand as much more investigation is needed to truly grasp the events and damage at this unit.